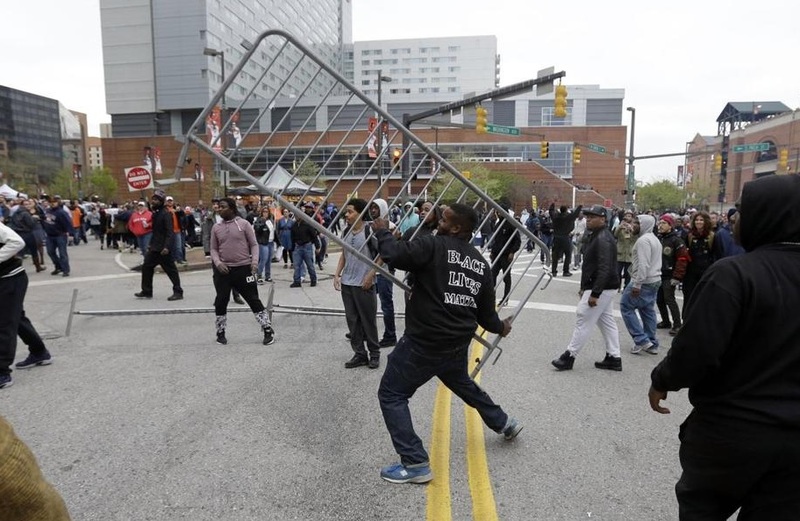 A state of emergency has been declared for the entire city of Baltimore overnight as whole neighborhoods were engulfed in rioting and destruction of property, plunging one more major American metropolis into civil turmoil over allegations of persistent police abuse of minorities. Hundreds of mostly teenage African-Americans began a frenzied rampage, throwing rocks at police lines and torching police vehicles and some buildings, just hours after leaders of the community had gathered to to bury 25-year-old Freddie Gray, who died one week being arrested by police with a severed spine. The Governor of Maryland, Larry Hagan, said he declared the state of emergency and activated National Guard troops to try to return calm to the city as “last resort. For hours, the rioters had apparently had free run of parts of the city, ransacking shops and setting fires with little sign of a police response. Officials said early last night that 15 of their officers had been injured in the violent clashes, some with broken bones, and they were all receiving treatment. Earlier a half-constructed community centre was hollowed out by fire, but officials couldn’t say if it was directly related to the unrest. Called the Mary Harvin Transformation Center, it was to serve local youth and family initiatives. However, an outlet of the CVS chemist chain was also set on fire after looters ransacked it. “We went in there and tore it up,” a 16-year-old, who said he was one of the looters inside, told Reuters. When emergency crews attached a hose to a fire hydrant a protestor slashed it with a knife. In the early hours of this morning there were reports of a second CVS set ablaze in the city. An unsual quiet early today was punctured by repeated sounds of sirens. The increasingly embattled Mayor of Baltimore, Stephanie Rawlings-Blake, described the rioters as “thugs” and said a city-wide curfew from 10pm to 5am would be imposed for a week starting from Tuesday. “Too many people have spent generations building up this city for it to be destroyed by thugs, who in a very senseless way, are trying to tear down what so many have fought for, tearing down businesses, tearing down and destroying property, things that we know will impact our community for years,” said Ms Rawlings-Blake. The trouble erupted just hours after the new US Attorney General, Loretta Lynch, was sworn in. She briefed President Barack Obama on the situation. “Those who commit violent actions, ostensibly in protest of the death of Freddie Gray, do a disservice to his family, to his loved ones, and to legitimate peaceful protestors,” she said in a statement. While most of the violence was centered in areas about 4 miles northwest of the business centre of Baltimore, a planned baseball game between the Orioles and the Chicago Cubs at Camden Yards by the harbour was postponed in case the unrest spread. Groups of young men had also roamed parts of the downtown district smashing windows and looting stores. A man boarding up one ransacked shop told The Independent, he had been offered bottles of looted vodka by looters for one dollar each at a nearby petrol station. “I swear to God, that’s what I saw,” said Faizan Shahid. He added angrily that he wanted to tell them to “shove them up there asses”. The police have yet fully to explain the circumstances of the arrest of Mr Gray but there has been speculation that he may have suffered the injuries that killed him while being taken to jail in the back of a police wagon. Suspects are placed in a narrow metal box in the rear of the vans and must be strapped in. Video has shown Mr Gray was not strapped in. The six officers who arrested him have been suspended with pay. The department has not revealed their ethnic backgrounds. All this came to the boil as the nation as a whole has been gripped by raw debate about how young blacks are treated by the police, which was ignited last August by the killing of Michael Brown, 18, in Ferguson, Missouri by a white police officer. The protests there were also violent, especially when a local grand jury elected to not indict the officer for any crime. Even as the funeral of Mr Gray was under way at the New Shiloh Baptist Church here, a police bulletin said the department had received a “credible threat” that several gangs including the Black Guerilla Family, Bloods and Crips usually at war with each other in the city were intending to unite and “take out” personnel and property their common target.